Haemophilia is a rare disorder that prevents the body from producing sufficient clotting factors, preventing proper blood clotting. It primarily affects men. Haemophilia can result in excessive blood loss due to injury or trauma. Also, spontaneous and repeated bleeding into the joints, kidneys, brain and throat can lead to a range of complications, including arthritis, permanent joint damage and associated loss of mobility. Although there's no cure for haemophilia, sustained replacement therapy and/or medication can enhance quality of life. Health care intervention can also treat or help prevent complications arising from regular bleeds. Treatment for haemophilia is based on the type of clotting factor that's deficient or absent – VIII or IX – and the severity of the condition. Physiotherapy and ventilation to improve the breathing process may be required on an on-going basis. As a high risk disorder that demands life-long medical intervention, haemophilia is one of 27 chronic conditions that automatically qualifies for Prescribed Minimum Benefits (PMBs). 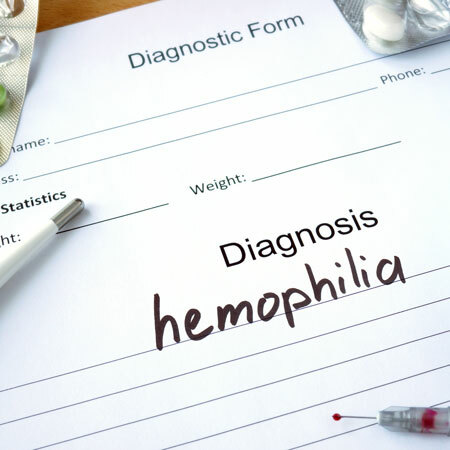 This means that all medical aid schemes in South Africa are required by law to cover the costs associated with the diagnosis, treatment and on-going care of members living with haemophilia after any applicable waiting periods/exclusions. Diagnostic blood tests for identifying the disorder and the particular blood clotting factor that's deficient or absent are covered from risk, rather than members' savings. The cost of a test for measuring actual blood clotting time is also covered under the PMBs. Although there's mandatory cover for basic diagnostic examinations, the number of covered tests and follow-up procedures per year varies from one medical aid scheme to another. Once an official diagnosis has been made and a GP or specialist has submitted the associated ICD-10 code to the medical aid, the member is usually expected to join a disease management programme. This programme oversees and pre-authorises appropriate treatment protocols. South African medical aid schemes cover a range of medicines for treating haemophilia as chronic benefits. Mild forms of haemophilia A, involving deficiency in factor VIII, are typically treated with desmopressin. This is a synthetically engineered hormone that stimulates the body’s production of the clotting factor. In moderate to severe cases, treatment is based on replacement therapy, during which regular doses of one or other of the clotting factors are administered. Antifibrinolytic medication is commonly used in conjunction with replacement therapy to prevent clots from breaking down. Pain medication, steroids and physical therapy may also be prescribed for the management of pain and inflammation in affected joints. To contain the costs associated with meeting PMBs, South African medical aid schemes are permitted to limit their members to using designated service providers and the medicines listed on scheme formularies, or medicine lists. However, the available benefits depend on members' plans. Lower-cost medical aid plans usually cover only consultations and procedures by designated GPs or specialists, at network or state facilities. Formularies are often restricted to generic medications. For other medicines, co-payments typically apply. Top-tier comprehensive options, on the other hand, offer benefits that exceed state-enforced PMBs. They usually provide cover for a larger number of tests and procedures, as well as for branded medications, and members can choose service providers, pharmacies and hospitals. With multiple open medical aid schemes offering a range of plans in South Africa, it’s not easy to determine the most appropriate option. It can also be challenging to identify differences in various schemes' medical aid cover for haemophilia and other chronic conditions. For expert advice on the best possible medical aid for your needs, contact an IFC consultant.